There just aren't enough hours in the day. Between attending classes, doing homework, giving or getting tutoring, socialising, working, playing sport, relaxing for a minute, eating, breathing and sleeping your day's pretty much packed full. Unfortunately being busy doesn't excuse you from your responsibilities, nor is it a good enough excuse when things slip between the cracks. Students in particular have a lot going on in their lives so managing your time well is a must. To get the most out of your precious time be sure to prioritise your activities, create to do lists, schedule your tasks, learn to say no and set up a daily routine. With so much planning behind you there's not reason not to make the most of your time. It's very easy to get caught up in small chores and tiny details and suddenly realise that your day has ended without you even getting started on an important project. Rather than waste time with the little things, sit down and prioritise the activities in your life. This could be something you do daily, or you could take a broader look at long-term plans such as for the term or the entire school-year. It may be that working is more important to you than singing in the choir, or getting tutored is more important than working. When you realise the activities which are truly important to you you'll be in a better position to make time for them. Once you determine how you will be spending your time, break your activities (and your time) down into manageable chunks. 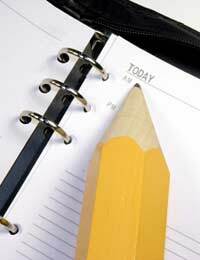 Create daily to do lists or action plans of items that you would like to get done that day. Remember to honestly assess how long your tasks will take you so that you don't overload your list, and don't be afraid to include even the smallest activities such as emailing your coach about next week's practice or ringing a friend about borrowing his book. Not only will making up a list relieve your mind of trying to remember everything, but crossing items off will give you a sense of accomplishment and confidence then you are making headway on your day. In addition to creating your daily lists, sit down one a week and schedule in any new commitments that have come up. Write in exam dates, deadlines, sports matches, music concerts, working hours, tutoring dates, firm plans with friends and family events which you will attend. Again, this not only frees your mind of the responsibility of remembering it all but it allows you to visually see how busy you are each day and plan your daily lists accordingly. It can also allow you to see how spread out your activities are across the week (or month) and might motivate you to move some appointments so that you have larger blocks of time free for other activities on days. For example, if you see that you are spending an hour three days per week commuting to and from a voluntary activity, maybe you can switch to volunteering for three hours on one day to eliminate extra commuting time. Depending on the activity and how many other people it involves you might consider asking for hours which suit you better, after all the worst they can say is no. Speaking of saying no, as a student you'll have to learn how to do this. New responsibilities and invitations crop up just about every day, but once you have your daily lists made and your tasks scheduled you'll know exactly how much time you have left over for more activities. If new events will take time away from the items you prioritised as most important then you'll have to say no so that you don't waste your time and find out that you have none left for your real commitments. As you become more comfortable with managing your time you'll probably begin to recognise certain patterns such as times when you feel particularly motivated, times when you feel particularly hungry and times when you feel particularly tired. If possible, listen to your body and try to set up a daily routine that works with its rhythms. Whatever you do, don't skip meals or skimp on sleep when you're busy. Not only could you potentially damage your health, but missing out on this fuel will just leave you extra-sluggish and less likely to get anything done efficiently. Managing your time as a student will require a significant amount of planning. Prioritise your activities, create to do lists, schedule your tasks, learn to say no and set up a daily routine to make the most of your time.